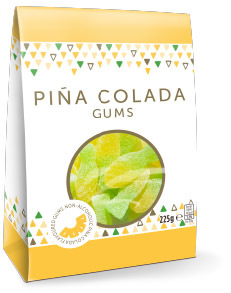 Our Pinã Colada Gums are a fun reminder of tropical evenings and far away places. Offering a great taste sensation you will love that exotic hint of pineapple, coconut and white rum. Sugar, Glucose Syrup, Water, Gelatine, Acidulants: Citric Acid. Tartaric Acid;Pinã Colada Flavour, Colourants: E120, E161b, E133.